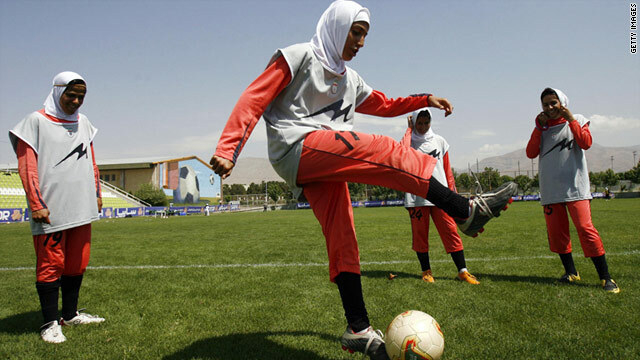 Iran's women's soccer team team practising in Tehran in 2009. (CNN) -- World football officials are defending their refusal to allow the Iranian women's soccer team to wear head scarves while playing in an Olympic qualifying round in Amman, Jordan. FIFA safety rules enacted last year allow women to wear "a cap that covers their head to the hairline, but which does not extend below the ears to cover the neck," according to a statement released by FIFA Monday. Iran's coach chose to forfeit last Friday's match with Jordan rather than dressing players in the smaller FIFA-approved head covering. "Despite initial assurances that the Iranian delegation understood this, the players came out wearing the hijab, and the head and neck totally covered, which was an infringement of the laws of the game," FIFA said. Three players on Jordan's team who wanted to wear hijab scarves for religious reason also sat out the match, FIFA said. The FIFA statement concluded that match officials "decided to apply correctly the laws of the game, which ended in the match being abandoned."